One spring morning five years ago, as I was watching chickadees flit around our backyard feeder, it occurred to me that those nimble little birds might appreciate having a trapeze on which to perch. When my son was a child I built him a trapeze, and he enjoyed it. Perhaps the chickadees would as well. Construction was simple. Rummaging in the garage, I found a remnant of 3/4” flat screen molding. From this I cut two six-inch pieces for the top and bottom bars. These I connected with a central, four-inch dowel. Using wire-cloth staples, I fastened two three-inch lengths of cuckoo-clock chain to the ends of the top bar, joining them at the middle with a handsome brass S-hook. My trapeze thus completed, I hung it from a branch of our pin oak tree. Ready for occupancy, it swung invitingly in the wind. Sadly, the chickadees showed no interest whatsoever. Not on the first day, the second, or the third. I reported their indifference to my wife, who had not yet heard about my project. When she did, a look of bemusement or perhaps incredulity came over her face. She counseled me to be patient. And patient I was, but to no avail. After another week went by, and not a single chickadee had set foot on my trapeze, Robin gently observed that perhaps the chickadees didn’t need a trapeze. They already had branches to perch on. My memory may be faulty, but I believe the word cuckoo might have escaped her lips. Being constructive, however, she suggested I place a few seeds on the lower bar of the trapeze. If the chickadees weren’t interested in gymnastics, they might be interested in food. Although I suspected that Robin was projecting her own preferences, I took her suggestion and laid a few safflower seeds on the lower bar. Unfortunately, the seeds repeatedly fell off. And for another week the chickadees continued to ignore my trapeze. I felt discouraged and ready to scuttle the entire enterprise. About that time, however, Robin came home from the Walmart garden shop with a plastic houseplant saucer. I could fasten it, she proposed, to the lower bar. My trapeze could become a feeder. Once again I took her suggestion, fastening the saucer facedown and placing some seeds on top. And in no time at all, the chickadees began arriving. No other birds partook of our offering, perhaps because the feeder was too flimsy to support them. 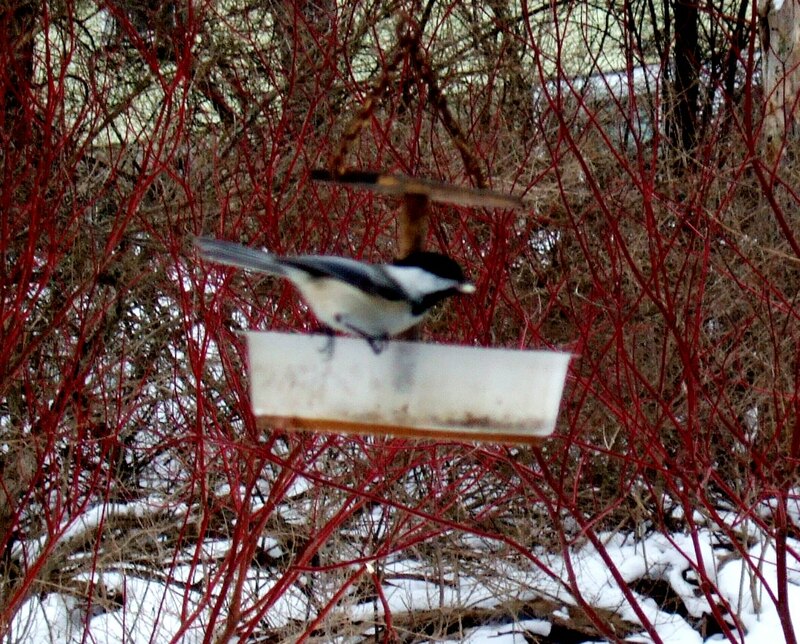 The chickadees had their feeder to themselves, and they seemed delighted with their privileged status. Over the ensuing months our joint creation grew increasingly popular. Through the summer, fall, and winter, we watched a profusion of chickadees come and go. But when Spring came round again, I thought it time to make improvements. First, I turned the saucer right side up, placing the lower bar beneath it. Second, I drilled four drain holes, so the chickadees’ breakfast would not get soggy when it rained. And third, I sealed the whole contraption with two coats of polyurethane varnish, giving it a pleasing amber glow. Thus was born the Greene Street Feeder, as we came to call it. Basking in our success, I made a dozen more, selling them at bargain prices or giving them away to friends and family. So far as I know, all are still in use, regaling chickadees as far away as Iowa, Syracuse, and Baltimore. Those tales may seem remote from Greene Street and its eponymous feeder, but the principle is the same. To bring our feeder into being, I had first to release any attachment to my original idea, whose time, it may safely be said, was never to come. No less important, Robin and I had to make do with what was at hand, be it a scrap of molding or a cheap plastic saucer. That saucer is cracked now, and the feeder is showing signs of its inevitable disintegration. But as I watch the chickadees dart in and out, I’m reminded less of the impermanence of our creation than of the organic process by which it came into being. By that process, I would submit, most of the things we value enter and leave the world, whatever our notions or expectations. * This phrase appears in a well-known poem by Layman Pang, quoted in Case 42 of the Blue Cliff Record. See William Scott Wilson’s The One Taste of Truth (Shambhala, 2012), 78. I am indebted to Mr. Wilson’s discussion. I see this in Zen halls, as well, as older students get more privileges and recognition. Dang, I see it in myself. Great story, Ben – I can hear Robin talk. The feeder is all the way in Lexington, VA! Nice demonstration of how to live our lives as a tea ceremony using styrofoam cups! And thanks Ben for adding Snow Branches to your blogroll – I’m enjoying exploring yours. Barry – How true. One exception to the pecking order of Zen halls is the practice at the Springwater Center for Meditative Inquiry, where even Toni Packer declined to call herself a teacher. Petra – Thanks for your comment. As I recall, you have two Greene Street Feeders. Where is the other one?